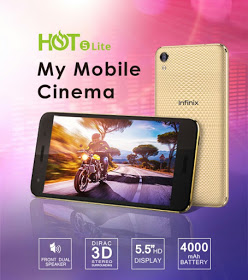 The infinix Hot 5 lite X559 is the lower version of the infinix Hot 5 x559 which was also launched the same time. Although both smartphones feature similar specs, the Hot 5 lite has a smaller memory and no fingerprint scanner. The infinix Hot 5 features a 5.5 inch IPS display. It is powered by Mediatek MT6580 Quad-core processor with a clock speed of 1.3GHz and also a 1GB RAM. The device runs on Android OS version 7.0 Nougat straight out of the box. 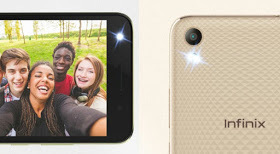 PRICE - Infinix Hot 5 Lite retails for 31,000naira in Nigeria, Ksh 3,998 in Kenya and GH159 in Ghana.